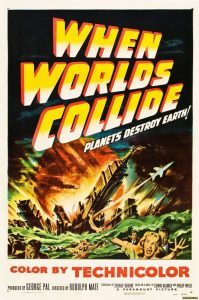 This is an often overlooked sci-fi movie from the 50s–being not nearly as famous as the excellent Day the Earth Stood Still or Invasion of the Body Snatchers. Despite this, it is still one of the best ones of its era. The basic story is good, but not great. What sets it apart are the characters within it and the insight into human nature it gives you. This makes the film very allegorical and makes you think. Many of the characters, such as the leads, rise to the occasion and only think of saving others when it appears most life on Earth will be destroyed. Then, there are the jerks who also show their true colors–such as the crowd who try to storm the space ship bound for a safe new world, and especially the evil old financier who who wants to save his own skin and could care less about others. John Hoyt plays this role beautifully and it is very, very much like the character C. Montgomery Burns from the Simpsons! Oh, and lest I forget, for 1951, the special effects are absolutely amazing. Aside from a pretty flat-looking matte painting used at the end, the space ship effects and flood effects were just terrific and earned this movie a well-deserved Oscar. This is a great sci-fi film that all fans of the genre need to see.